"Gensan" redirects here. For the city in the Philippines, see General Santos. "Port Lazarev" redirects here. For the present-day urban settlement in Russia, see Lazarev (urban-type settlement). 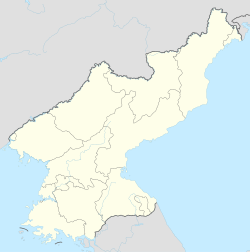 Wŏnsan (Korean pronunciation: [wʌn.san]), previously known as Wŏnsanjin (元山津), Port Lazarev, and Gensan (元山), is a port city and naval base located in Kangwŏn Province, North Korea, along the eastern side of the Korean Peninsula, on Sea of Japan and the provincial capital. The port was opened by occupying Japanese forces in 1880. Before the 1950–1953 Korean War, it fell within the jurisdiction of the then South Hamgyŏng province, and during the war it was the location of the Blockade of Wŏnsan. The population of the city was estimated at 329,207 in 2013. Notable people from Wŏnsan include Kim Ki Nam, diplomat and Secretary of the Korean Workers' Party. In 2013, it was announced that Wŏnsan would be converted into a summer destination with resorts and entertainment. Having spent his childhood years there, Kim Jong Un has expressed significant interest in further developing the region, with the construction of new infrastructure such as Kalma Airport, a dual-use civilian international airport and military proving ground. A state corporation, the Wonsan Zone Development Corporation, has been established with feasibility studies for a wide variety of hotels and commercial and industrial development. Wonsan has also been known as Yonghunghang, Yuan shan in China, Genzan or Gensan in Japan, and Port Lazareva or Port Lazareff in Russia. Wŏnsan's area is 269 square kilometres (104 sq mi). It is located in Kangwŏn Province, on the westernmost part of the Sea of Japan (East Sea of Korea) and the east end of the Korean peninsula's neck. Mt. Changdok (Changdok-san) and Mt. 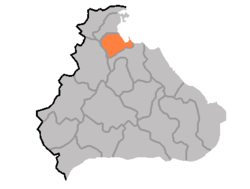 Nap'al (Nap'al-san) are located to the west of the city. More than 20 small islands flank Wŏnsan's immediate coastal area, including Hwangt'o Island and Ryŏ Island. Wŏnsan is considered an excellent natural port location. Kŭmgang-san mountain is located near Wŏnsan. Wŏnsan serves as the administrative centre of Kangwŏn Province. The city has a humid continental climate (Köppen Dwa/Dfa). Wŏnsan opened as a trade port in 1880. 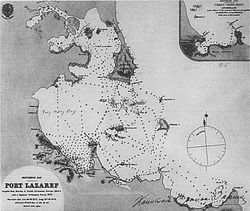 Its original name was Wŏnsanjin (元山津), but it was also known by the Russian name of Port Lazarev (Lazaref). Under Japanese rule (1910–45) it was called Gensan (元山). In 1914 the P'yŏngwŏn and Kyŏngwŏn railway lines were opened, connecting the city to P'yŏngyang (then known as Heijo) and Seoul (then Keijo or Kyŏngsŏng). Thus, the city gradually developed into an eastern product distribution centre. Under the Japanese occupation, the city was heavily industrialized and served as an import point in the distribution of trade between Korea and mainland Japan. After the Korean War broke out it was captured by American and South Korean troops on 10 October 1950 during their drive north. When they left ahead of the Chinese counter-attack, the city fell under Chinese control on 9 December 1950. It was heavily bombed and shelled by the United Nations in the Blockade of Wonsan during the Korean War. According to the official US Navy history Wŏnsan was under continuous siege and bombardment by the American navy from March 1951 until July 27, 1953, making it the longest siege in modern American naval history. By the war's end the city was a vast shell. As part of a planned $582 million redevelopment of the city centre, which is to be entirely demolished and rebuilt, a 5-star hotel, a 17-storey Wonsan International Finance Centre and a $9.6m exhibition hall are expected to be built. Wŏnsan used to be in South Hamgyŏng, but when provincial borders were redrawn in 1946, it joined the northern half of Kangwŏn (which had been split at the 38th parallel north into a zone under Soviet control in the north and one of American control in the south in 1945) and became its capital, as Kangwŏn's traditional capitals Wŏnju (1395–1895) and Ch'unch'ŏn (since 1896) both were south of the 38th parallel and south of the Military Demarcation Line that replaced the 38th parallel as a border in 1953. Wŏnsan has an aquatic product processing factory, shipyard, chemistry enterprise, a cement factory, as well as the 4 June Rolling Stock Works, which is one of the DPRK's largest railway rolling stock factories. The district of Wŏnsan-si is served by several stations on the Kangwŏn Line of the Korean State Railway, including a branch to the port; it is also connected to the national road network, and is the terminus of the P'yŏngyang-Wŏnsan Tourist Motorway and the Wŏnsan-Kŭmgangsan Highway. The city has the dual purpose military and civilian Wŏnsan Airport (IATA: WON) equipped with 01/19 and 15/33 dual runways. Images from Google Earth from July and August 2014 indicated that major expansion was taking place, including the construction of two new runways. There is also an underground air force runway which runs through a mountain, near Wonsan. North Korea's first public air show, the Wonsan International Friendship Air Festival, was held at Wonsan Airport in September 2016. Wŏnsan was also the terminus of the Mangyongbong-92 ferry that operated between Wŏnsan and Niigata, which was the only direct connection between Japan and North Korea. This service was cancelled in 2006 when Japan banned North Korean ships. The Korean Central Broadcasting Station maintains a 250-kilowatt mediumwave transmitter broadcasting on 882 kHz AM. Wŏnsan is home to Songdowŏn University, Kŭmgang University, Tonghae University, Jong Jun Thaek University of Economics, Wŏnsan University of Medicine, Jo Gun Sil University of Engineering, Wŏnsan First University of Education, Ri Su Dok University, and the Maritime Patrol Academy, the commissioned officer's training school of the Korean People's Navy. The city is home to Unp'asan Sports Club, a association football club that plays in the DPR Korea First Class Sports Group, North Korea's premier league. Wonsan has long been a popular tourism destination for both Koreans and international visitors. Attractions include Songdowon beach, the site of the Songdowon International Children's Union Camp, which maintains exceptionally clear and clean water. Pine trees are abundant in the surrounding area, and it has been designated a national sightseeing point. The nearby Kalma Peninsula is to feature a new hotel and a bathing area. Announced in 2014, the Wonsan Special Tourist Zone is to cover more than 400 square km and boasts 40 historical relics, 10 sand beaches, 680 tourist attractions, four mineral springs and several bathing resorts and natural lakes. As part of this development the Masikryong Ski Resort was built in 2016. A $123m golf course is planned outside the city. Famous scenic sites near Wŏnsan include Myŏngsasimri, Lake Sijung, Chongsokchon and Mt. Kŭmgang. Temples in the area include the Sogwangsa and Anbyon Pohyonsa Buddhist temples. The German Church is the former church of the Tŏkwŏn abbey, now used by the Wŏnsan University of Agriculture. ^ Ryall, Julian (27 June 2013). "North Korean leader Kim Jong-un orders the creation of nation's first beach resort". The Daily Telegraph. Retrieved 29 June 2013. ^ Park, Ju-Min; Pearson, James (10 October 2017). "Special Report: In Kim Jong Un's summer palace, fun meets guns". Reuters. Retrieved 15 October 2017. ^ "Wonsan, North Korea". Weather OnLine. Retrieved 2011-10-21. ^ "Klimadaten". Spiegel Online. Retrieved 2012-04-11. ^ "Wonsan Key Seaport Before War Started; Badly Crippled by U.N. Air and Sea Attacks". New York Times. June 30, 1951. Retrieved 2009-02-17. ^ Jon Halliday and Bruce Cumings, Korea, the Unknown War (NY: Pantheon Books, 1988), p. 157. ^ "Wonsan: Where tourism meets tanks". Reuters. ^ "Wonsan airport undergoing major renovation, expansion - NK News - North Korea News". 19 January 2015. ^ Mizokami, Kyle. "North Korea's Secret Strategy in a War with America: Go Underground". The National Interest. ^ "North Korea's Thunderbird Runways". 19 May 2008. ^ "North Korea's Underground Bond-Villain Air Base Nears Completion". freekorea.us. ^ "Ferry ban turns tide on Korean smuggling". The Washington Times. 2006-10-16. Retrieved 2015-04-15. ^ "AUGUST MASS GAMES TOUR". YOUNG PIONEER TOURS! The Budget North Korea Tour Operator. Archived from the original on 8 January 2014. ^ Park, Ju-min; Pearson, James. "In Kim Jong Un's summer retreat, fun meets guns". Reuters. ^ "Kim Ki Nam". 5 October 2010. ^ Vyas, Utpal (2010). Soft Power in Japan-China Relations: State, Sub-state and Non-state Relations. Oxon: Routledge. p. 107. ISBN 978-1-136-85896-3. ^ "Secretaría de Relaciones Exteriores - Gobierno - gob.mx" (PDF). www.sre.gob.mx. ^ "Kim Jong Il Holds Third Summit Talks with Putin during Tour of Far Eastern Region of Russia". Archived from the original on 17 August 2016. Introduction to Investment Projects in Wonsan-Mt. Kumgang International Tourist Zone, Wonsan Zone Development Corporation. Pyongyang, 2016. Wikimedia Commons has media related to Wonsan. Wikivoyage has a travel guide for Wonsan. North Korea Uncovered, (North Korea Google Earth) a Google Earth map of Wonsan's cultural, economic, political, military infrastructure, and tourist locations and facilities.